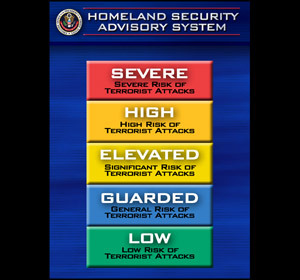 Terrorist Threat Level Returned to "Elevated," Reduced from "High"
(Sept. 24, 2002) -- The federal government has returned the nation's terrorist threat level to "Elevated" (yellow) from "High" (orange). At today's daily news briefing, White House spokesman Ari Fleischer said the decision tstemmed from a review of intelligence, recent arrests made in U.S. and the passing of the September 11 anniversary. The President made the decision this morning to lower the threat level, Mr. Fleischer said. He indicated that the public should remain vigilant since the nation remains at an elevated risk of a terrorist attack. When the color code system was first implemented in March, the original level was "Elevated" but was raised to "High" on September 10 Orange.